A modification to a common antibiotic makes it more effective at fighting MRSA, a type of antibiotic-resistant bacterium, according to new research. With drug-resistant infections on the rise and the development of new antibiotics on the decline, the world needs a new strategy in the fight against increasingly wily bacteria. Now, scientists think the small molecular attachment that helps conventional antibiotics penetrate and destroy their targets may be a possible solution. The attachment, known as r8, helps guide antibiotics through a bacterium’s outer defenses and encourages them to linger, says co-lead author of the paper on modification Alexandra Antonoplis, a graduate student in chemistry at Stanford University. That penetration and tenacity help kill bacteria, such as methicillin-resistant Staphylococcus aureus, or MRSA, that doctors would otherwise struggle to stop. Indeed, adding r8 to vancomycin, a first-line defense against MRSA, made the new drug hundreds of times more effective, according to experiments the researchers conducted. The same strategy could apply beyond MRSA to other drugs and infections, the researchers believe. “You don’t have to invent a new drug. You just have to fix the problems with existing drugs,” Wender says. “It’s a global health problem, and we need new treatment strategies, because of the increasing emergence of bacteria that are resistant to antibiotics and the limited number of antibiotics in our pipeline,” Cegelski says. According to one report, the number of new FDA-approved antibiotics dropped 90 percent over the last three decades. 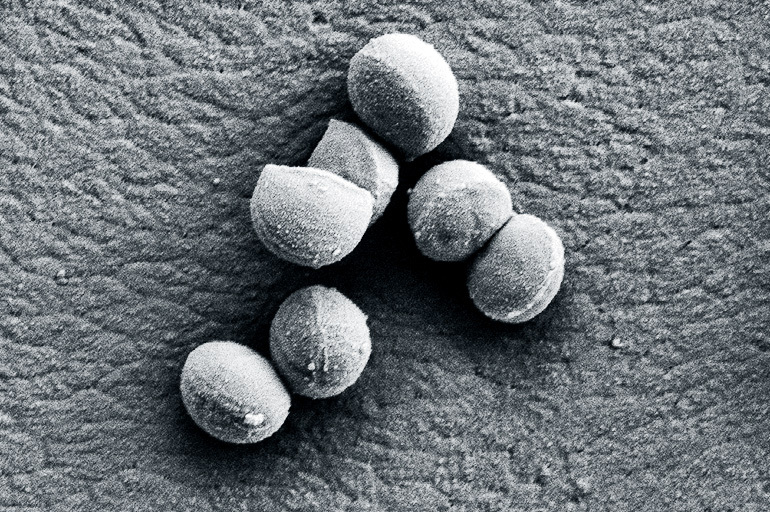 The current first-line treatment for MRSA has been in use since 1958. Vancomycin is largely useless against two of the bacteria’s key defenses, however. First, MRSA has a tendency to form biofilms, colonies of the bacteria embedded within a protective membrane that drugs have a hard time penetrating. Second, MRSA bacteria can lie dormant for extended periods, during which time vancomycin doesn’t work—meaning doctors need an antibiotic that can stick around until MRSA bacteria start to wake up. The solution, researchers believe, lies not in designing an antibiotic from the ground up, but rather in modifying vancomycin with r8 to help it break into a biofilm and stick around long enough to attack cells once they awaken. To test vancomycin with the attached r8, dubbed V-r8, the team pitted both it and vancomycin against MRSA in a free-floating state and in biofilms. When bacteria were floating around freely in a liquid, both vancomycin and V-r8 were able to kill off most of the bacteria. But in biofilms, V-r8 was around 10 times more effective, demonstrating that it could penetrate a biofilm and kill bacteria inside. V-r8 also clung to MRSA bacteria twice as well as vancomycin and was vastly more effective at entering MRSA cells, suggesting it could hang around long enough to kill dormant cells. Researchers conducted all those experiments, however, in lab dishes. To see how V-r8 would do in a real infection, the team treated mice infected with MRSA with both V-r8 and vancomycin. The new version, they found, killed about 97 percent of bacteria after five hours, about six times more effective than vancomycin without the r8 attachment. The results do not mean that a new antibiotic is headed straight to the clinic, even for testing—that is likely still years away. Still, Wender says, they do suggest a new way to build antibiotics: by modifying existing antibiotics with synthetic components to give them new abilities, such as the capacity to break through biofilms. The team next intends to test the drug-modifying strategy in other bacteria in the hope of finding similar results and a way forward in dealing with antibiotic resistance. “This was just the first effort,” Cegelski says. The paper appears in the Journal of the American Chemical Society. Additional coauthors are from Stanford and from Nanyang Technical University in Singapore. The National Institutes of Health, the Singapore National Research Council, the Stanford Center for Molecular Analysis and Design, and the National Science Foundation funded the work.